HARRISBURG, Pa. (CNS) — Prayerfully and joyously welcomed into St. Patrick Cathedral for his installation Mass as the 11th bishop of the Diocese of Harrisburg March 19, Bishop Ronald W. Gainer held up St. Joseph — whose feast the church celebrated that day — as “a challenging example” for the members of the church. Speaking of Joseph’s designation as a “just man,” Bishop Gainer said the description of the saint goes far beyond his decision to take Mary into his home, as was recounted in the day’s Gospel. “Everything we were told about Joseph indicates that he was indeed a just man. This primary attribute of Joseph gives us not only an overall appreciation of who he was, but it aligns him with the greatest figures in the Old Testament,” he said. “The biblical concept of a life lived in humble obedience to the word of God — a life in which law is not an external imposition and love an internal sentiment, but a life in which law and love are not opposed but united — can be summed up in this single idea of a just man,” said the bishop. At the cathedral doors, during the entrance rite for the Mass, Archbishop Charles J. Chaput of Philadelphia received Bishop Gainer presented him to Father Thomas Rozman, pastor of the cathedral parish, and Father Robert M. Gillelan, Jr., who served as diocesan administrator after Harrisburg Bishop Joseph P. McFadden died in May 2013 and before Bishop Gainer was installed as his successor. 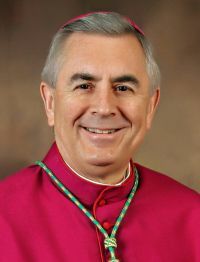 The bishop was head of the Diocese of Lexington, Ky., when Pope Francis named him to head the Pennsylvania diocese in late January. Father Rozman presented the bishop with a crucifix to venerate with a kiss, and then Bishop Gainer sprinkled those present with holy water. The entrance procession included a Knights of Columbus honor guard, diocesan seminarians, ecumenical and civic leaders, deacons, priests, bishops, archbishops and cardinals; including Cardinal Justin Rigali, retired archbishop of Philadelphia, and Archbishop Carlo Maria Vigano, apostolic nuncio to the United States. Archbishop Vigano then read the apostolic letter from Pope Francis appointing Bishop Gainer as bishop of Harrisburg. The congregation, which included faithful from the dioceses of Harrisburg and Allentown, Pa., — the bishop’s home diocese — and the Diocese of Lexington erupted into a sustained standing ovation as Bishop Gainer sat the bishop’s chair, or cathedra, thus taking possession of the diocese. Applause again echoed through the cathedral when Bishop Gainer began his homily. In greeting those present, he particularly thanked the faithful from Lexington for their love, support, and collaboration. “While the song in my heart now will once again be the ‘Pennsylvania Polka,’ there will always be an echo of ‘My Old Kentucky Home’ in my heart,” he said. As he did during solemn vespers on the eve of the installation, Bishop Gainer spoke of the virtues of St. Joseph, among them his obedience to the messages given to him in his dreams. “Only a man who is inwardly watchful, spiritually awake, would be able to discern that these encounters in dreams were genuinely revelations of God’s will. Only someone who has a graced sensitivity for God and for the ways of God can receive God’s message in that way,” the bishop said. He spoke of the courage of St. Joseph, who took Mary into his home, and moved the family on several occasions for the welfare of Mary and Jesus. “Joseph’s response to each of these situations reveals his extraordinary obedience and his exceptional courage,” Bishop Gainer said. “The example of St. Joseph can inspire us all at this time of transition in our lives and in our Church,” he remarked. “Our devotion to St. Joseph must go far beyond his real estate intercession for us when we’re trying to sell our homes. Bishop Gainer said he pledged that day “and always, my life and my energy” to his role as bishop in service to the church.